Martin O'Neill saw the Republic of Ireland scrap their way to just a second Nations League point as they ground out a 0-0 draw in Denmark. 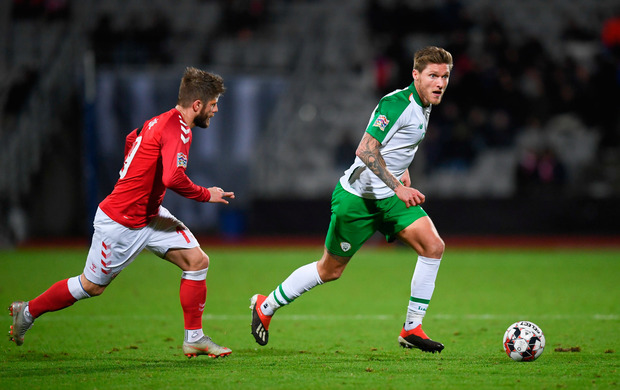 Ireland, who were second best in their friendly stalemate against Northern Ireland on Thursday evening, were resilient in Aarhus as they held the Danes, who had already secured promotion to League A, to a goalless draw for the third time in four attempts in a little more than a year. However, they needed the help of the woodwork on a night on which they failed to muster a single attempt on target. They have now not scored in 397 minutes of football, while their nine games in 2018 have yielded just a single victory. O'Neill, who handed Southampton's 18-year-old Michael Obafemi a debut as a second-half substitute, will take positives from a gritty display, but will once again face questions over his team's lack of ambition, something which will have to change radically if they are to mount a credible bid for Euro 2020 qualification. Enda Stevens enjoyed an early escape when, having lost full-back Peter Ankersen, he appeared to tug the full-back's shirt inside the penalty area, but crucially not in the opinion of Azerbaijani referee Aliyar Aghayev. The Danes, who trounced the Republic 5-1 in Dublin 12 months ago, were surging forward in numbers and skipper Christian Eriksen saw a goal-bound effort blocked by Shane Duffy before Yussuf Poulsen whistled his follow-up just off target. Ireland skipper Seamus Coleman bundled the ball towards goal as Robbie Brady's mis-hit 13th-minute shot rolled into his path, but it took another block by Duffy to deny striker Nicolai Jorgensen after Poulsen's clever flick had put him in on goal. With Lasse Schone, Eriksen and Poulsen orchestrating behind frontman Jorgensen, the visitors found themselves having to defend deep. They survived once again 14 minutes before the break when Poulsen headed Schone's teasing cross tamely at goalkeeper Darren Randolph. Brady curled a 34th-minute free-kick into the side-netting after Schone's foul on Jeff Hendrick had handed Ireland a rare opportunity. However, Coleman had to be in the right place at the right time to block Jorgensen's shot after Randolph had palmed away Ankersen's dangerous low cross and Eriksen clipped a free-kick inches over Randolph's crossbar as the half drew to a close. An off-balance Poulsen skied over from close range within two minutes of the restart, with Tottenham schemer Eriksen, who scored a hat-trick in Dublin 12 months ago, having made way at the break, and Coleman put his body on the line once again to block Martin Braithwaite's well-struck 54th-minute effort. Pierre-Emile Hojbjerg drilled over from distance two minutes later with the Republic camped deep inside their own half and they very nearly succumbed with 21 minutes remaining. Defender Richard Keogh dwelt on the ball and was robbed by Jorgensen, who raced in on goal and beat Randolph, only to see his shot come back off a post and substitute Lukas Lerager blast the rebound high over. Obafemi arrived with 10 minutes remaining, but found himself engaged in a rearguard battle as the visitors clung on to their point.